Nursing Care　×　IoT　=　"Mimalog Cloud" | What is safe and secure facility for user? | What is thoughtful watching service? | What is ICT system easy to use for staff? The voice of related people such as user, family, staff and manager is incorporated. 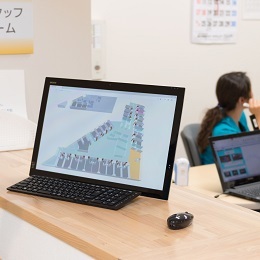 To introduce the cloud service「Mimalog Cloud」intended for the most advanced nursing care facility. 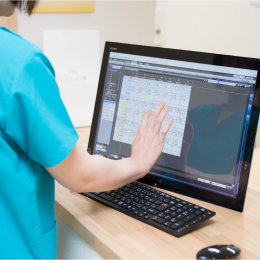 Safe nursing care cloud has achieved regardless of location, low installation costs and high operational stability. IoT Technology for the most advanced nursing care achieves automation of care center and labor saving. You can easily input business records with Blue Ocean notes.Sensor information in the room or building is automatically inputted. We will surely watch over bed and toilet while considering privacy with noncontact vital sensor and human sensor. To let users with smile and no burden to spend everyday comfortably, what shall we do? To let he entrust his parents to us safely, what shall we do? To make staffs actively, smiling to provide services, what shall we do? Through ICT and IoT, “Mimalog Cloud” is a system formed by the passion idea. 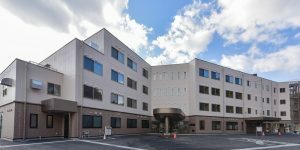 “Mimalog cloud” is developed based on know-how of long-term facilities management by the Yasuragikai Social Welfare Corporation. Saito Facility Director (the Yasuragikai) as the designer has seeked ideal elderly housing with services from a few years ago. At the time of Hakusandai Yasuragi Kan opening, the dream is achieved by evolution of ICT and IoT technology visited. 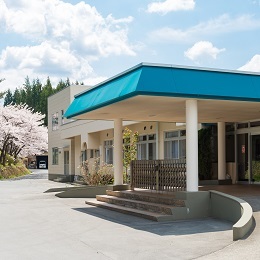 Beginning with the idea for several years, the opportunity is visited in the summer of 2015, and the “Mimalog Cloud” and “Hakusandai Yasuragi Kan” were born in the spring of 2016. At auspicious day March 21, 2016, 「Hakusandai Yasuragi Kan」 was born in Hachinohe City by the ‘Sanpo-yoshi’ principle (benefit for user, family and facility) with new technology power. Under high morale staff, the business is also supported by Mimalog Cloud fused by Blue Ocean Note and IoT sensor at this instant. About details of mechanism that the Hakusandai Yasuragi Kan had and made maximum use of ICT and IoT technology, please see FUNCTIONS section. 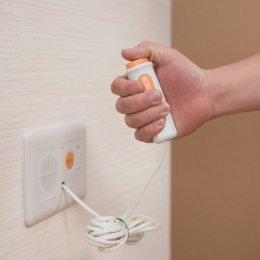 It works together with nurse call automatically. It can save nurse call history and call staff automatically by nurse call in an emergency. Sleep monitoring (heartbeat・breathing・body motion) by non contact vital sensor, and monitoring life condition by IoT sensor in room and toilet while considering privacy. For detecting wandering, the safety of common use space is monitored by camera. The platform for powerful data storage and analysis is used. There is the platform for predicting life rhythm of users and analyzing large big data from nursing facility. BLUE OCEAN SYSTEM CO., LTD. In the 「Hakusandai Yasuragi Kan」 completed on March 21, 2016, Mimalog Cloud has already started thoroughly.